Newton D. Baker writes to Woodrow Wilson, regarding the issue of John B. Jenkins, Jr., and his discharge from the National Guard service. On January 10th you sent me a letter from Mr. RH Dabney, of the University of Virginia, with regard to the case of John B. Jenkins, Jr., Corporal, Battery B, 1st Battalion, Field Artillery, Virginia National Guard. Applications for the discharge of this soldier have been made continuously from the 28th of September until now. A re-examination of the distressing circumstances surrounding this young man have led to a belief on my part that he should be discharged from the service, and it has accordingly been done. I inclose a carbon copy of this letter, which it seems to me you may desire to forward to Doctor Dabney in order that he may know of the action taken. 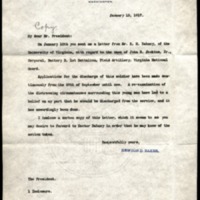 Baker, Newton Diehl, 1871-1937, “Newton D. Baker to Woodrow Wilson,” 1917 January 13, WWP20518, University of Virginia Woodrow Wilson Letters, Woodrow Wilson Presidential Library & Museum, Staunton, Virginia.